Dare I Say The SIL Shawl Is Almost Done? The SIL shawl has 3 more rows before it is completed. 3! I know I shouldn’t show how giddy I am at being so close to calling it complete, the gods of knitting don’t like that sort of thing, but I can’t help it; there is so little good news around. The amount of work needed to complete the 3 rows will probably take 3 nights of knitting, but after working on it so long 3 nights seem like almost nothing. I must stop this crowing or the gods will put some really difficult road blocks in front of me and the darn thing will take 3 weeks and not 3 days. Is it possible it could be packed up and in the mail before 24 November? Be calm my rapidly beating heart. Or am I having a heart attack just thinking of the end of this shawl? When I realized I was coming to the end of the shawl I briefly panicked wondering what I would knit next. But I have a cowl and fingerless mitts I’d like to complete before winter is over so I think I will concentrate on that for a bit. Then there are socks that I started for Big Foot aka The Skipper, but I am rethinking the design. I also have the massive Shetland Shawl to do, but I have to bounce some questions off of you guys first before I start that. 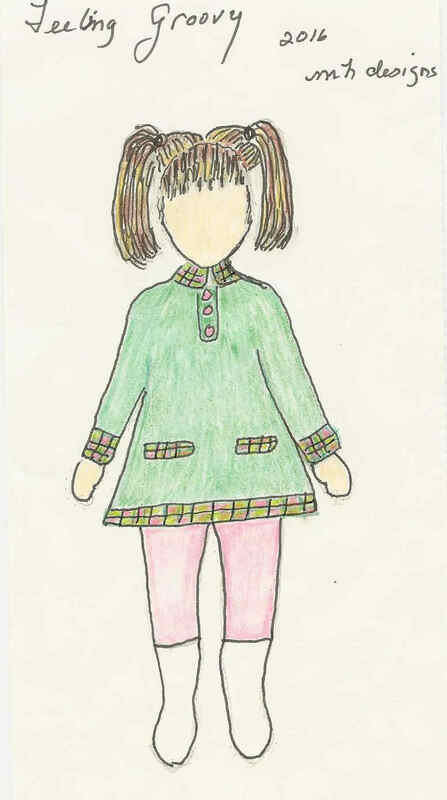 I also have the Anastasia baby sweater pattern to write up. I started doing that in earnest yesterday. Instead of figuring out all the numbers for all the sizes as I created the sweater as I usually do, I decided to try what I thought would be a simpler method. I knitted and recorded all the numbers for one size within the pattern. The “simpler” way will never be done again. I am finding it more time consuming than if I had figured everything out as I went. The only thing saving me from madness is that I made two schematics: one detailing all the sizes the other all the stitches and rows. At least the schematics give me a starting point for all the other sizes. The great thing about grading a pattern is that I literally close myself off from all media while I am doing it. Not hearing, seeing or reading the news is a massive plus right now. In other interesting news, we have a female fox hanging around the house at night. Last night she was on the patio, much to Yarn Rascal’s dismay. She is beautiful and looks healthy but it is unusual for foxes to come as close to the house as she does. I am going to have to encourage her to stay her distance by shooing her when she is that close. It’s fine when they turn and go, not so great when they decide to stay their ground. Speaking of which, for the time being I have lost the battle of the yard with the big buck. When he doesn’t want to move, he doesn’t move. Rather cheeky of him, but his testosterone is high this time of year and it affects his common sense. He is majestic looking when he is being obstinate and since there is no hunting allowed on our land, I know he’s safe here. SO all in all I’d rather have him around than end up a trophy on someone’s wall. The Pembroke baby sweater pattern is now live on Ravelry. My original inspiration for designing this was the rugby sweater. Tired of the same old stripes, I played around with color and shape to create a look that was not like everything else out there. The result is an individualist sweater that is different from the rest of the stripes out there. Best of all, the unique look doesn’t come at the expense of knitting frustration. 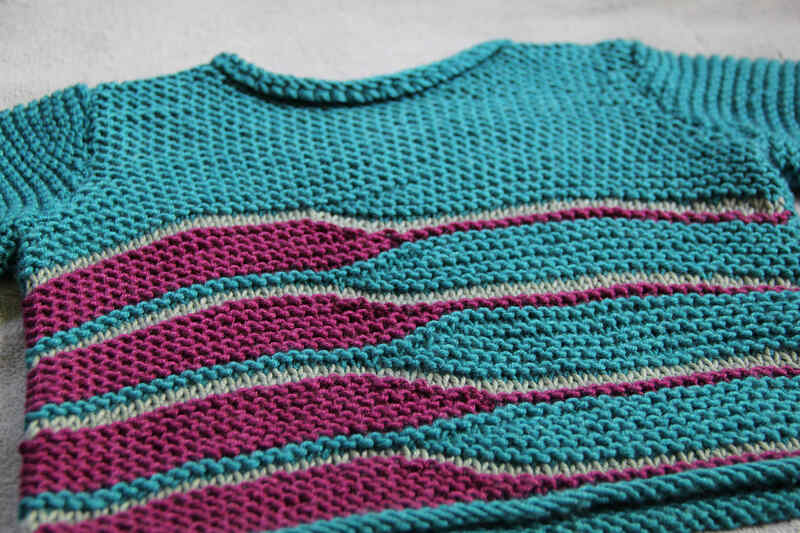 The sweater is a quick, fun knit done in garter stitch. 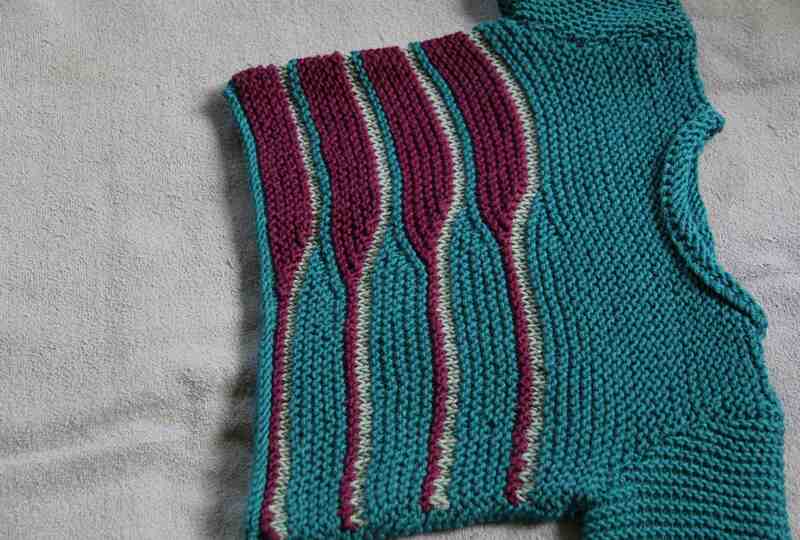 The striping is only on the front, leaving the back plain, so there is no anxiety of having to match up stripes when finishing the sweater. The rolled neck, hem and cuffs also make for easy finishing. The stripes are made in easy no-wrap short-rows. The short-row instructions are easy to follow and the knitter can’t get lost. Each row is written out and stitches are counted for you. All you need do is enjoy the knitting. Today will be our first 80 F / 26 C degree day. The first real temperature change always throws me for a loop. I either over estimate or under estimate how warm or cool it’s going to get and end up dressing inappropriately. I have no illusions of getting it right today. In other news, Yarn Rascal has decided he’s a hunter this year. His breed has no hunting genes, but that doesn’t seem to stop him. He runs from window to window and door to door yipping and growling as he whips himself up into a small lunatic. All the animals are moving this time of year, but we don’t know which one in particular is setting him off. His breed is known to wander. The yard is large and bordered by woods on three sides, so the Rascal is always on a leash when he’s outside. It is quite an exercise for the arms walking him when he is in hunting mode. On the upside, yarn is the farthest thing from his mind when he is hunting. It is also the growing season. Racks and racks of seedlings are sitting downstairs under grow lights, getting the tending that all seedlings need. Some have been repotted already, others are just reaching the repotting stage. I can’t complain about The Skipper this year, because I’ve added a significant number of seedlings to take us over the normal amount. Once again I have meticulously researched and sought out specific flowering plants that deer and rabbits don’t eat. I’ve selected color and the texture of the foliage so that it is a harmonious mix. Something enjoyable to look at during the summer. I’ve made sure that the plants are beneficial to birds, bees, and butterflies. Usually the whole scenario ends badly. Either the deer or rabbits decide to extend their menu options or The Skipper, in his infinite wisdom, mistakenly pulls them up thinking they are weeds. I am going to do my best to try and avoid those scenarios this year. Knitting has taken place. Pictures will be forth coming. 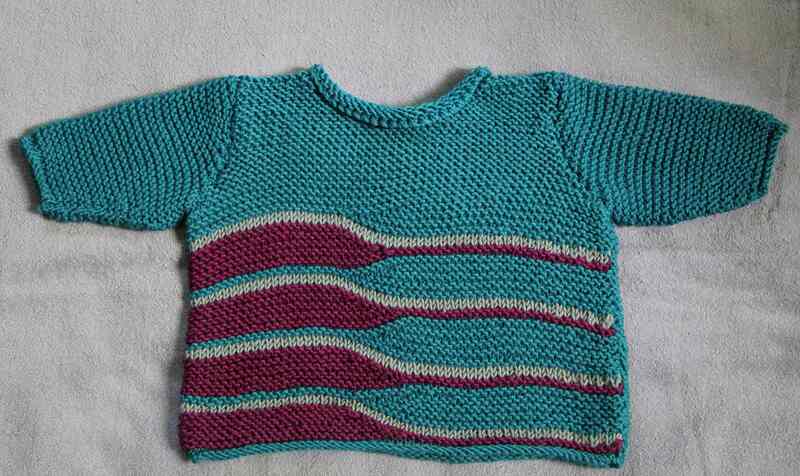 One baby sweater is ready for public release. The second is ready for test knitters. The third is trying my serenity, but is close to done…providing the yarn holds out. Yes, I may have miscalculated yardage. Yes, it is a specific hand-dyed colorway that cannot be matched. Yes, the bonnet is crucial to the look of the overall design. No, I don’t know what I am going to do if I run out of yarn. To make it even more interesting, I used scrap yarn from my stash for a color accent. I thought I had enough of that yarn too. But now I don’t know. I’ve tossed the stash to find more, but came up with nothing. This is masochistic knitting at its best. Still, I knit on. Things have calmed a bit. In the lull, I’ve been able to mess up work on finalizing the New Rugby Sweater. It should see the light of publishing next week. What’s basically held this up is my dithering over page design and general layout of my patterns. Now that I have the logo I want some standardization of the way the pages look from pattern to pattern. What I’ve come up with might stun you. After all this time I’ve reached the conclusion that a knitting pattern is a knitting pattern. Knitters buy it to make the item. They need a clean layout that easily shows the stages of the project with lettering that won’t make their eyes cross and headings that are easily recognizable. It’s meant to be understood at a glance. A pattern is not a brochure. The next item that needs attention is writing up the Feelin’ Groovy Sweater. Yes I am finally at that point. The proto type is done. I do like the way it turned out. I will be looking for test knitters by next week. Pictures of the sweater are coming. At the moment nothing pressing is on the needles. I have two pairs of socks: one toe up the other cuff down in progress, my spring sweater’s back is waiting to be finished, and the Rock Island Shawl is still in a time out, a Shetland inspired baby blanket is still waiting, but instead I have turned my attention to a vintage 1920s baby sweater design and cap that’s been rolling around in my head for what seems like forever. I’ve sketched out the idea. Ruffles on collar and cuffs, with a few inches of smocking on the sleeves and across the upper part of the chest. The problem is that ruffles and smocking don’t go well with the yarn I really want to use. I’ve gone up down and all around with needle sizes, but it’s the yarn. It doesn’t want to ruffle and it doesn’t want to show off the smocking. So I am in need of another yarn. The problem of course is which yarn. Hence, I am without an immediate project. The weird thing is I am not in angst over not having a project. I rather like not having to pick up needles and yarn. This is, of course, worrisome behavior. Now that I don’t necessarily sit down with yarn and needles before the television, I really can’t help but watch the news and take it in. I find that disturbing. I also get to see all the commercials and experience how trite and stupid they are. Hundreds of television channels and not a thing to watch. How did civilization come to this? I realize there is a lot I don’t take in when I am knitting and perhaps it is the best way to watch television. Otherwise I feel like I am wasting my time. Pockets, Pockets Where Do You Go? The big news around here is we missed the snow. I gleefully removed the covers from the lettuce, peas, and hellebore, but have refrained from tossing the delphinium seeds into the ground. What we did get instead of snow was wind. Lots and lots of heavy wind. Tree limbs and trees all succumbed. Then the eager beavers with their chain saws were out. The buzz of a chain saw is as grating on me as the sound of a dentist’s drill. So while I was not enjoying listening to the chain saws, I figured it was a good time to tackle the grading of the Feelin’ Groovy sweater. I love math the same way I love root canals, which is not too much. The grading went well up to the point of placing the faux pockets. The world is full of standards. I know this. But try and research pocket placement standards. When I get in a design jam similar to this I resort to the sewing industry for information. The faux pockets were placed properly for the 12 month size I am knitting. What I need to know is does the distance from the bottom to the top of the pocket stay the same over the other three sizes or does it change. The distance from center changes, but does the vertical distance change too? I strongly suspect it does. I’ve done two days of searching the illuminating internet and while I can find all sorts of standards for insignia and logo placement on clothing I’m coming up with zilch on pocket placement. The thing about pockets, it seems, is that the garment industry tends to frown on them because they increase production cost. Therefore, wherever and whenever they can do away with them they do. I searched in every knitting book I have for the answer. I perused every knitting and sewing pattern I have for the answer. I am now into searching library books. When that fails, and trust me, it will, my next search will be at Jo-Ann Fabrics through their sewing patterns looking for the one that most closely resembles what I am doing and covers the sizes I am working in. If all the above fails, I will make mock ups of the three remaining sizes and eyeball placement. Then I will knit the three separate sizes up to their faux pocket joins to find the specific rows and stitch counts for placement. In the meanwhile, I am going to knit the collar of the sweater. I completed sewing in the sleeves and seams last night while watching The Skipper’s grandson’s team lose in the latest basketball tournament play. Even with this loss, they had a great season and should be proud of what they did achieve. I was knitting along on the Feelin’ Groovy baby sweater’s sleeve, positive that I had the wrong numbers, when the weather guy on the television said the words “snow” and “5 to 12 inches” (13 to 30.5) cm. I sputtered a little in my knitting, changing to purl stitches on what was clearly a knit row as I glanced at the television sure the guy was talking about the mountains of Colorado or something equally distant and high. But The Skipper wasn’t watching the Weather Channel, he was watching the local news station. My next two thoughts were almost simultaneous. Damn I have to rip those purl stitches out and why is the local weather guy talking about the Adirondacks? Before I eradicated the purl stitches I once more looked over my notes and again felt sure I had botched the sleeve numbers. Then I went on to speak about a happier topic: the possibility of getting a jump on the planting season and dropping the delphinium seeds into the ground early. I had, after all, already planted the peas and lettuce. I returned to knitting the knit rows and purling the purl rows when The Skipper said didn’t I just hear snow was coming for the weekend? I instantly began to purl again on a knit row. For the record I want MoNa (Mother Nature) to know that I plan to fight back. This morning I bought the proper row covers to keep the snow off the lettuce and the peas. I will install them this windy, grey, gloomy afternoon. Also, I am not going to plant my delphinium seeds as planned. As for the hellebore that has promising blooms on it, I am going to construct a cover to save it from your wrath. MoNa can do what she wants this weekend, while I figure out why the numbers on the knitted sleeve seem wonky.